In order to test out how best to create a library of visual elements, Gill drew one Illustrator image of a mid-sagittal section of a rat brain. 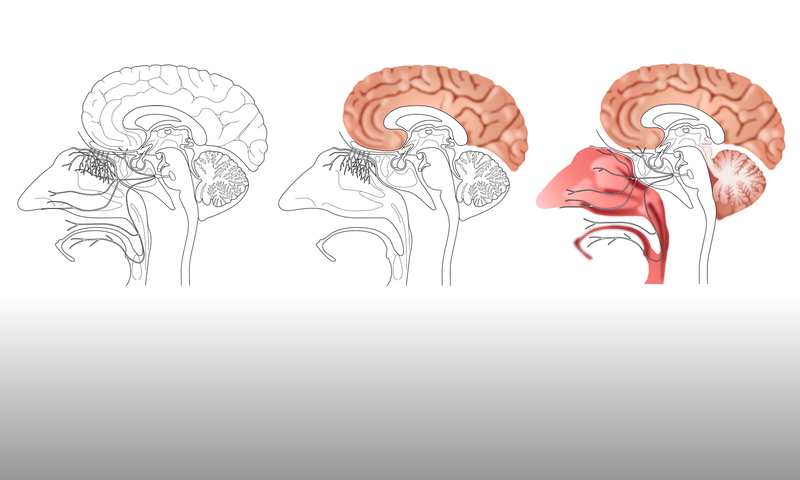 The drawn image was a simplified version of a photograph (shown below) and so both the shapes and the colours were based on anatomy, rather than on a more diagrammatic representation of the brain. Once the image had been drawn, which took two or three hours, it was relatively quick to then create another 14 versions of the brain section, ranging from a simple line outline of the whole brain, to using bold (non-anatomical) colours to highlight different visual elements. These different images are shown in this gallery blog post. The aim of producing these different versions is to give scientists a range of images to choose from. The gallery blog post is actually quite a good way to display relatively small, low resolution versions of the images. Including the name of the image allows a viewer to then find the corresponding Illustrator file and / or high resolution image file. They could then use the image file directly, or use the Illustrator file as a starting point for their own editing. These images are designed to work on a white background, which should be suitable for journal articles. For oral presentations at conferences, slide templates are often provided and these may have a coloured background. A white background is undoubtedly the best choice when displaying figures, and should be used if at all possible. If a coloured background cannot be avoided then this must be taken into account when generating the figures, as it will significantly affect the choice of colours to use. All of the images in the gallery could be classed as anatomical, as the shapes are based on the original photograph, even if the colours have been changed. If a more diagrammatic representation is required, then it would be better to use a different image as a starting point, rather than spend too long attempting to edit one of these images. In order to build up a useful library of visual elements, time and effort would have to be spent at the beginning of the process to create a set of suitable ‘starter’ images. However, a wide range of ‘variations on a theme’ could then be quickly generated from these.